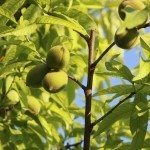 How do you prune a peach tree, newly planted? Anytime you have a newly planted tree, you want to give it a year to establish itself before pruning it. You want the tree to put its energy towards growing roots so it can be healthy. If you prune it before it is established, it will put energy towards healing itself and this will make it more susceptible to disease and pests.